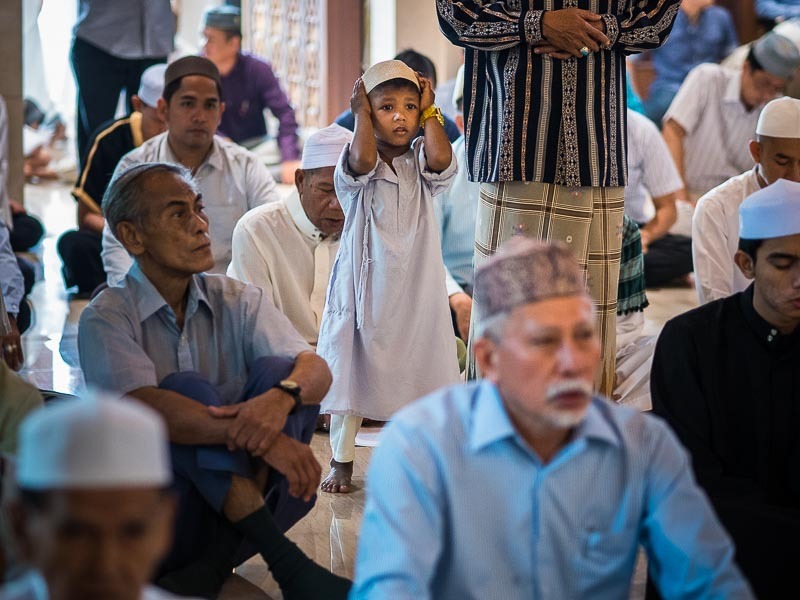 A boy, standing next to his father, prays in Ton Son Mosque before Eid al-Fitr services at the mosque. Friday was Eid al-Fitr, also called the Lesser Eid, a Muslim holy day that marks the end of the month of Ramadan. 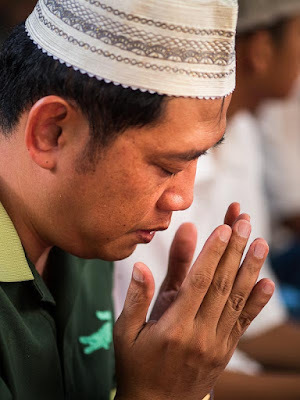 I went to Ton Son Mosque in the Thonburi section of Bangkok to photograph Eid. Ton Son is one of the oldest mosques in Bangkok. Although the name and buildings have changed through the centuries, Ton Son Mosque traces its history back to the 1680s. That's older than Bangkok itself. To put the mosque's antiquity into perspective, it's older than most cities in the U.S.
A woman walks down a flight of stairs to go to the mosque for Eid services. Ton Son Mosque is on Khlong Bangkok Yai and below a large bridge that goes over the khlong (canal). When you pass the mosque in a car you don't see the mosque, just the minaret domes that rise above the road deck. The mosque was packed. Inside was completely full. The small courtyard in front of the mosque was covered by awnings and more people sat outside than actually in the mosque. Men pray under awnings put up for shade in front of the mosque. There's a sprawling cemetery around the mosque. It's a quiet, peaceful place. Heavily shaded, it's a respite from the hustle of Bangkok just a few meters away, outside the mosque's walls. 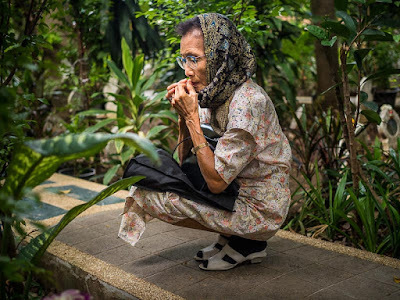 A woman prays at her parents' grave. The cemetery at Ton Son Mosque is nearly as historic as the mosque. Thai Muslim generals who fought with King Taksin the Great, who reestablished Siam (now Thailand) after the Burmese sacking of Ayutthaya, are buried in the cemetery. Thailand is overwhelmingly Buddhist. Official statistics acknowledge that Islam is the second largest religion in Thailand but there's a huge gap between number 1 (Buddhism) and number 2 (Islam). Government statistics say the breakdown in 93% Buddhist, 5% Muslim, 2% Christian, Jewish, Sikh and everything else. 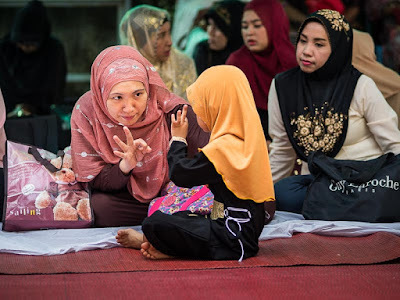 A woman talks to her daughter during Eid services at Ton Son Mosque. I think the official statistics underestimate the number of Muslims in Thailand. I wouldn't be surprised if closer to 10% of Thailand was Muslim. 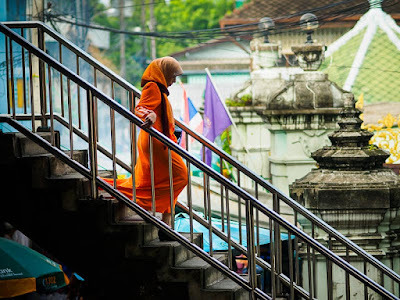 There are Muslim communities pretty much everywhere here, from the Deep South (which has a Muslim majority) to Chiang Mai and Chaing Rai, in the far north of Thailand. Muslims in Thailand are a very diverse group. In the Muslim majority Deep South, most Muslims are ethnic Malay. In western Thailand, along the Myanmar border, there are Rohingya and Muslims from Burma. In central Thailand, many of the Muslim people have Cham roots (Muslims from Cambodia and southern Vietnam). In northern Thailand, around Chiang Mai and Chiang Rai, many of the Muslim people have Chinese roots from Muslim communities in Yunnan. 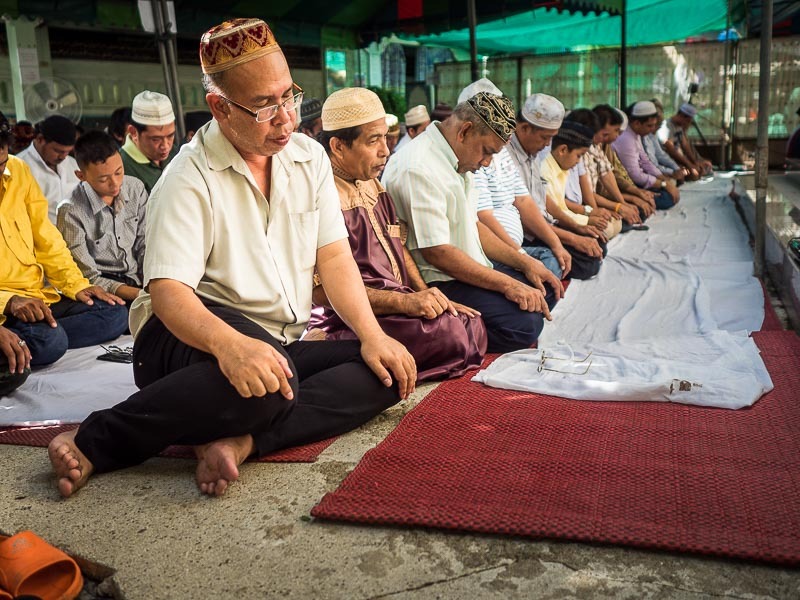 Muslim communities in Thailand are as diverse as Thailand itself. There are more photos from Eid (and Islam in Thailand) in my archive.